Alcohol and Running: Do They Mix? Runners and alcohol have a complicated relationship, but David Barton, owner of David Barton Gyms, has found a way to take one part fitness and two parts alcohol to make it "socially acceptable." With locations in New York, Chicago and Miami, this trendy gym has paired with Svedka Vodka to host a post-workout happy hour that keeps you sweaty and sipping. Each week, David Barton Gyms offer intense bootcamp workout classes, which feature drills, sprints, abdominal work and several other forms of exercise that will leave your muscles beat and ready to relax. So after the intense workout comes a refreshing taste, as fitness buffs indulge with a Svedka Vodka cocktail. Although it might seem counterproductive to go for a run, do a treadmill workout or beat your body up at a bootcamp class and then pour yourself a cocktail instead of a glass of water, David Barton stands by his motto that "it's better to work out and drink than to not work out and drink." But is alcohol really a good idea for runners? Many long distance die-hards love how a post-run beer feels for their fatigued muscles. Like most things in life, moderation is key. A healthy lifestyle that includes nutritious foods and regular exercise can certainly allow for some indulgences, including a cocktail post-workout. Just keep in mind that alcohol can affect many factors that go into making you a faster and fitter runner. Alcohol is a powerful diuretic, and dehydration is never a runner's friend. The risk for muscle cramps, muscle pulls, muscle strains and general fatigue increases when dehydrated, so drinking extra water after a night of hitting the bars is more than necessary to regulate your body for your next run. Consider drinking light beer or alternating between an alcoholic drink and a glass of water or sports drink. 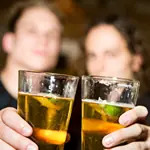 Alcohol also impedes the body's ability to get a solid night of sleep, so think about the negative effects of late-night drinking, especially the night before a race or hard workout. In general, alcohol slows reaction time, reduces hand-eye coordination and even interferes with lactic acid breakdown, leaving runners extra sore the day after hard exercise. With decreased reaction time and coordination, runners leave themselves susceptible to random injuries on their next run. More: Does Beer Affect Your Training? Alcohol is often considered to hold "empty calories," meaning it has no nutritional benefits but still posesses 7 calories per gram. It stores similarly to fat in the body, and excess consumption could mean an increase of body fat percentage; something most runners aim to avoid. However, moderate drinking—which is two drinks a day for men, one for women—doesn't have much effect on runners. Hot weather and anti-inflammatory drugs don't mix with alcohol, but a cold beer after a race won't hurt future performances. Less is definitely more when it comes to alcohol and exercise, but if social drinking is a must, make sure you re-hydrate properly, consider your sleep schedule and don't make alcohol consumption a lifestyle. More: Can Beer Improve Your Run Time? Running Examiner Jessica Cickay is an experienced runner and writer from Boston, Massachusetts. Examiner.com is the inside source for everything local. Powered by Examiners, the largest pool of knowledgeable and passionate contributors in the world, we provide unique and original content to enhance life in your local city.